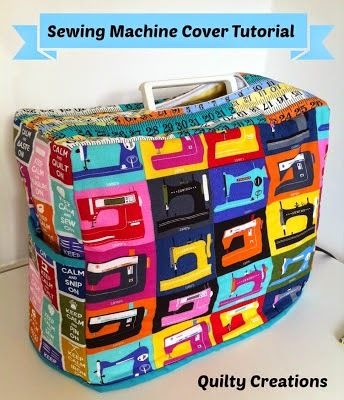 My sewing machine cover is complete and, as promised, here is how I did it (grab a cuppa - this is a long post). To begin with I measured my machine and listed the measurements on a sheet of paper. Add 1" to the width, depth and height to allow for seam allowances. (Note: I have a little Husqvarna Viking H100Q measuring 15” wide x 11-12” high x 8” deep). 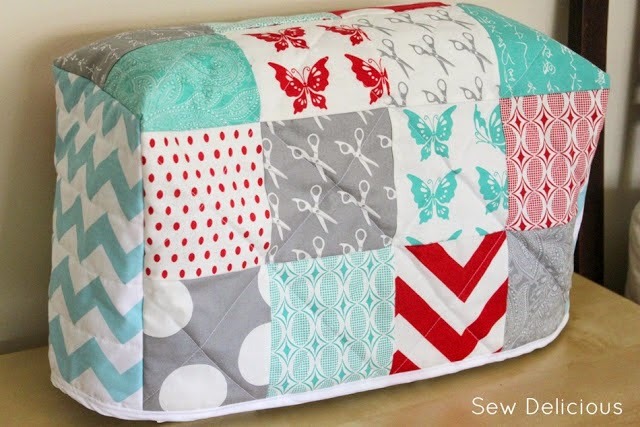 I used Sew Delicious’s cover as inspiration and patched twenty eight 4½” (cut) squares to create a panel measuring 28½” x 16½”. This doesn’t seem big enough given the machine’s dimensions but when I laid it over my machine it draped down the front and back onto the work desk so I knew it would fit just fine even after quilting. Next I wanted to create a gap for my machine’s handle – essential as I take my machine out-and-about with me. I added ½” to the length of the sewing machine handle (for me this was 6½” + ½” = 7”) and did the same for the thickness of the handle (½” + ½” = 1”). Using these measurements I marked a piece of interfacing with a rectangle measuring 7” x 1” - this would be my stitching line. In the middle of this rectangle I marked the actual length of the handle (6½”) and drew lines up to the corners as shown. These would be my cutting lines. I placed the lining fabric RIGHT SIDE FACING UP on top of a rectangle of batting (both the lining and batting were 5” larger than my patched rectangle). I then positioned the patched rectangle on top of the lining, RIGHT SIDE FACING DOWN (thus lining and patchwork are right sides together). Finally I pinned the marked interfacing rectangle to all layers, in the approximate position of the handle (slightly to the right of centre). 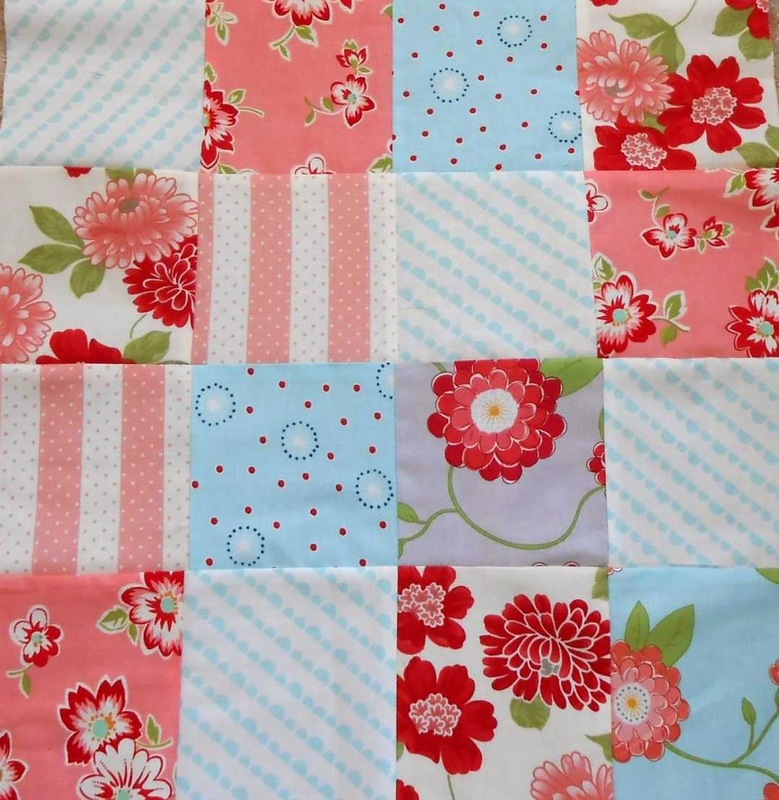 Using a small machine stitch, I stitched along the solid rectangle marked on the interfacing. Once this was done I cut along the central line and out to each of the corners as indicated by the dashed line. NOTE: Do not cut right into the corners as you may cut through the stitching – cut as close as you dare. 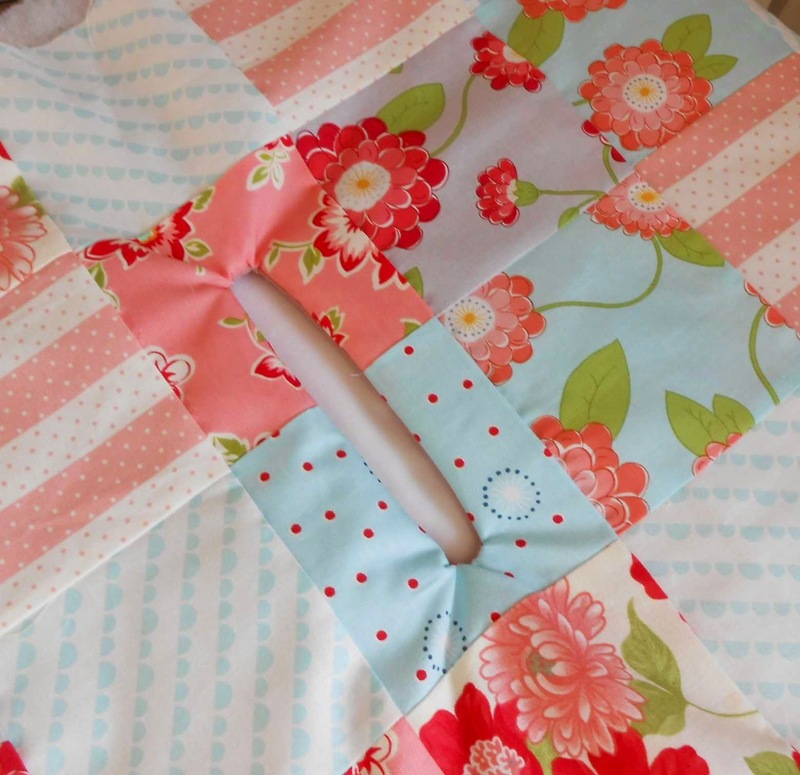 My finished corners are always a little rumpled when using this method as I am cautious of cutting into the stitching. However, if you do cut through to the stitching you can always re-stitch around the solid line again. from the gap as you press, the lining will disappear from the front of your cover. 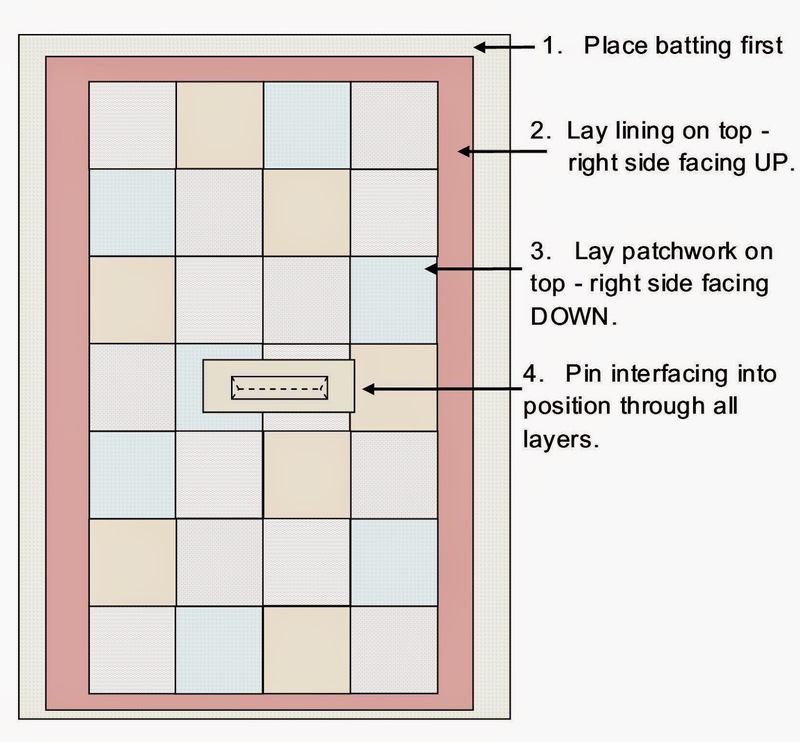 Once done, turn right-side out by pushing the patched rectangle through the stitched gap (the lining and batting should now be lying behind the patched rectangle). Press. Once pressed the lining is no longer visible. 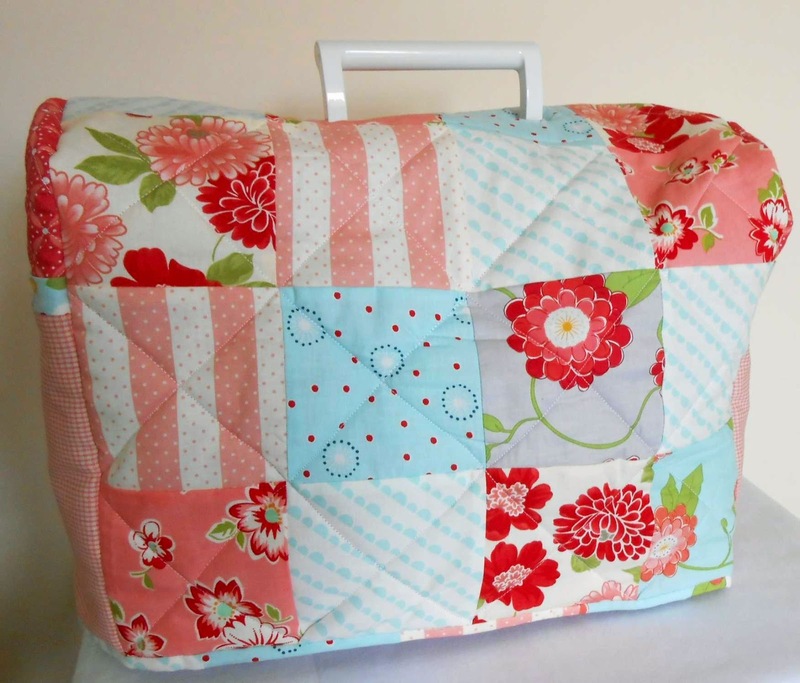 .....or you can do as I have done and top-stitch around the gap before quilting the rest of the cover. 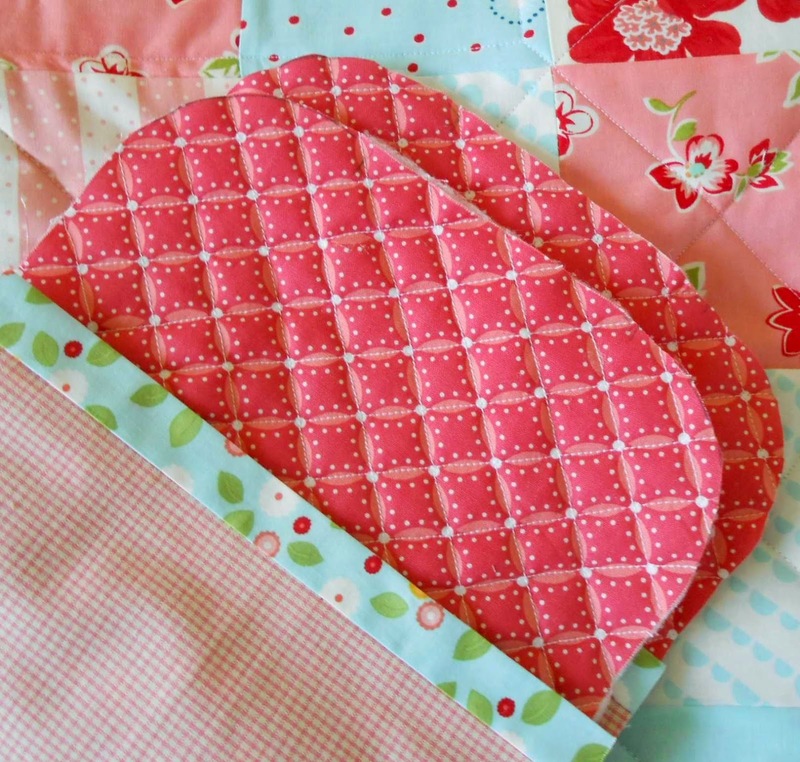 Next I made the pocketed sides using another blogger's tutorial which is, unfortunately, no longer available. So here is how I created the pockets ...... For each pocket I cut one pocket lining, one pocket outer - both approximately 8½” (wide) x 8” (tall). I placed them wrong sides together and bound the top edge using 2" strips of fabric and the single-binding method. Next I cut the a side panel to measure 10" x 14" (the dark pink fabric in the photo below). I placed a piece of batting behind the side panel and quilted it (simple cross-hatch). I repeated this for the second end panel/pocket. I quilted the side panels before adding the pockets. Once the side panels were quilted I trimmed them both to measure 8½” wide by 12” high and I rounded off the top corners using my Frixion pen (it disappears once ironed - very clever). I lay the two pockets on top of the quilted side panels and pinned them in place. I drunk the tea before using the mug as a template. I didn't want splashes on my new sewing machine cover - well not on the first day of use anyway! 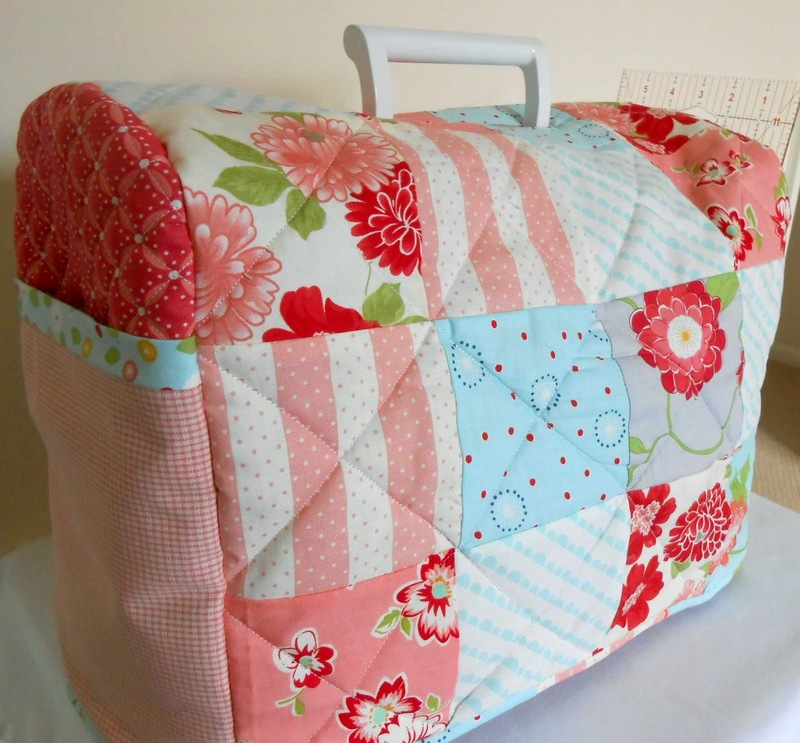 Then it was just a case of pinning and stitching it all together which was made easier by those rounded corners. Finally I bound the bottom using 1¼” scrappy binding. .... and my 12” x 6” cutting ruler, Dresden template and other notions in the other pocket. 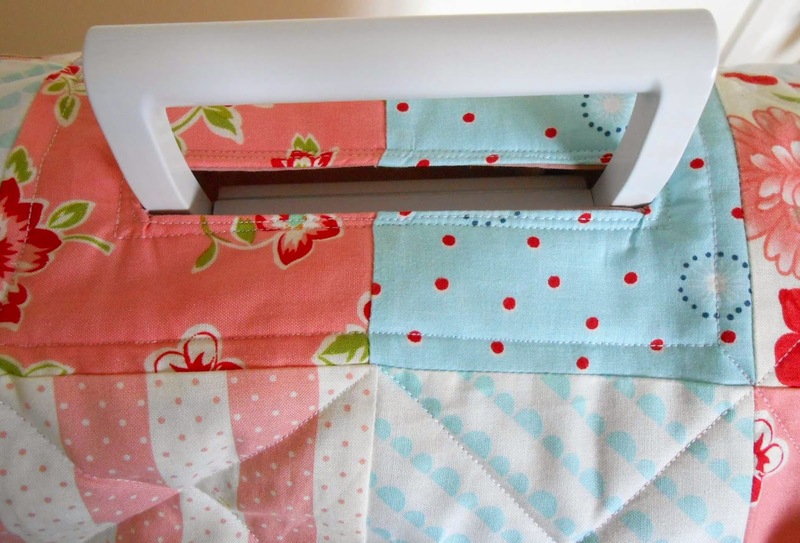 If you want to add a handle gap to a sewing machine cover you have already made then take a look at Quilty Creations’s version. 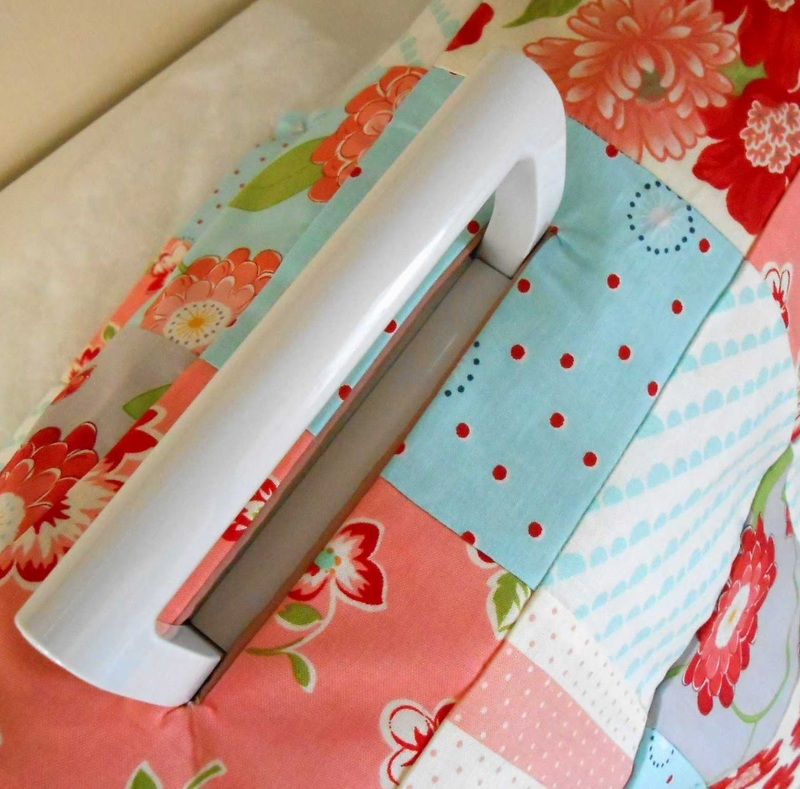 Karen uses a small piece of fabric to create the handle lining and I think this could be incorporated into an already made sewing machine cover (she also details how to make her own cover complete with side pockets). Don't forget to share a photo of your cover - old or new - over at the Across the Pond Flickr group. I admit I haven't read the whole thing but it is very nice and sweet cover. Just in case you didn't already know that :) I love the pockets! Sometimes the pictures are enough Vera. I am very pleased with how it has turned out and the pockets will be a great help. It's perfect... and ready to go out and about the English countryside!! 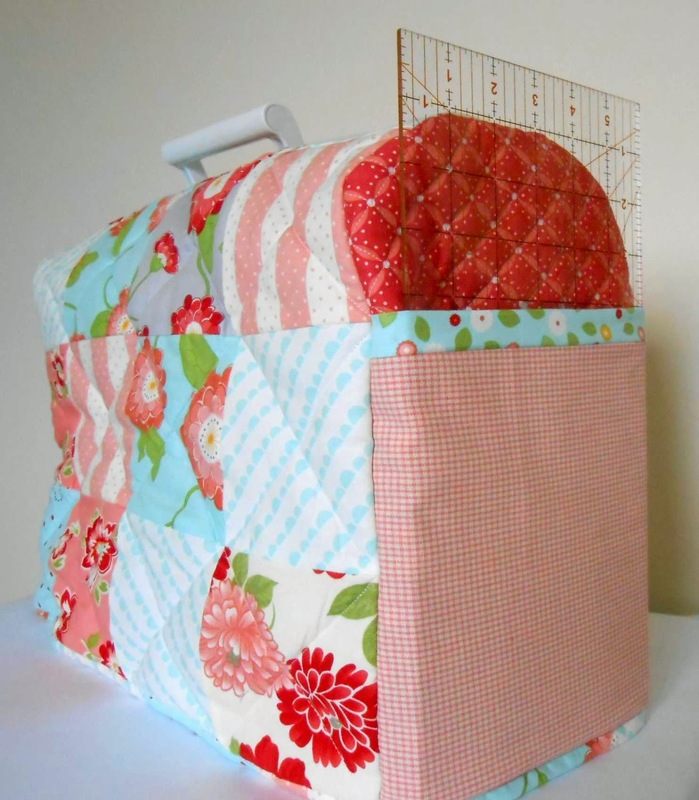 I really LOVE your fabrics, and how you can take rulers and tools in the side pockets! Sew pretty!! It is almost as lovely as your yellow patchwork cover Susie. Thank you Christine. My machine sits on the worktable at the end of my bedroom so it helps if it looks pretty! This is such a gorgeous cover! 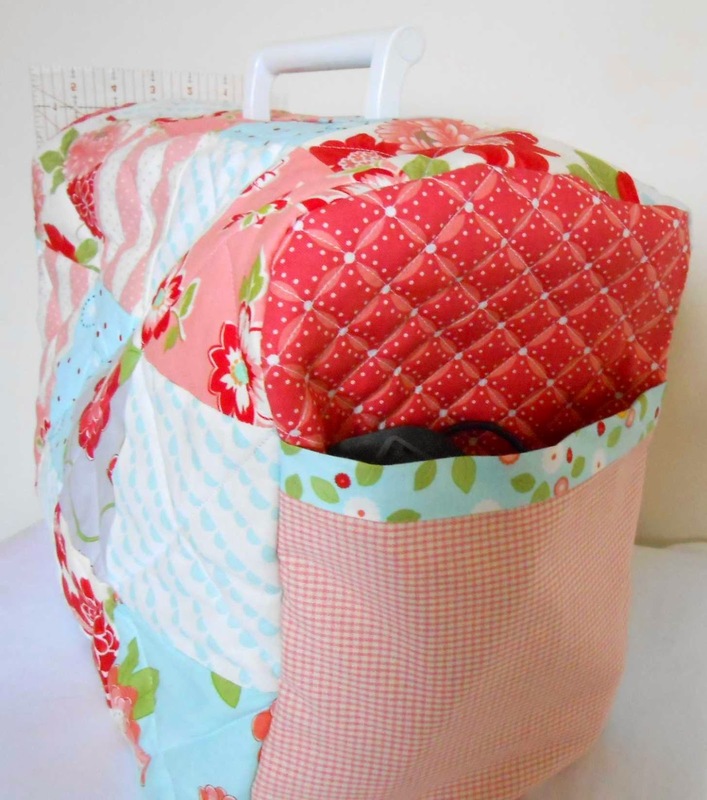 It will brighten even a "non-sewing" day, and those pockets will keep things handy when you do have sewing time. Very, very nice. The fabric is so sweet! Pockets too? You are so clever of course you'll need them for traveling and storing "parts." lol what a great job you did not only is it lovely but useful. And that handle opening. BRAVO!!! I am attempting to make a cover today... decided to insert a zipper instead of a handle opening... should be fairly easy, yes? 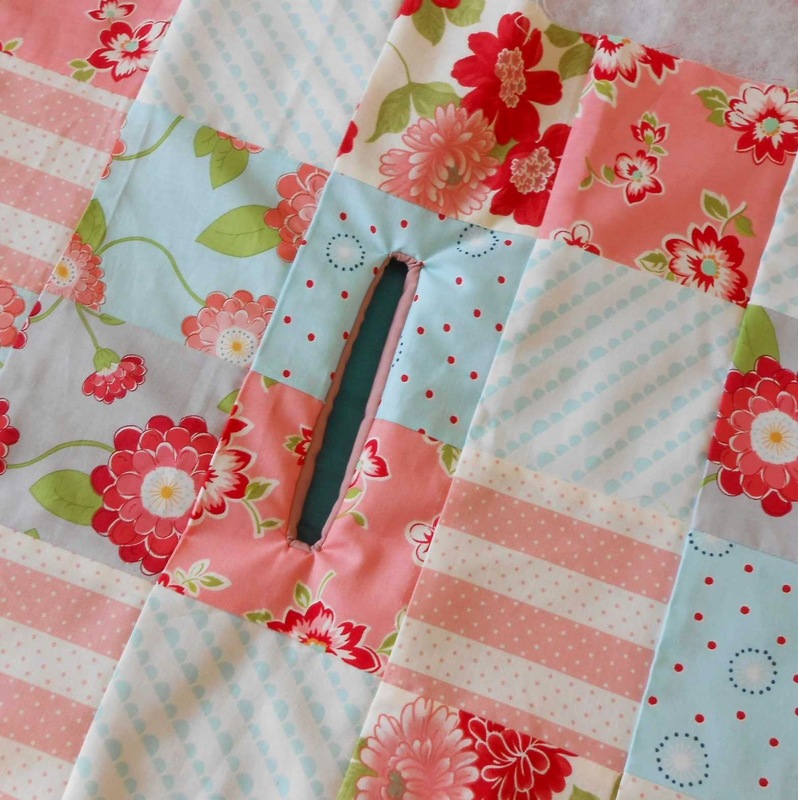 Yes, it should be fairly easy - just lay the zipper behind and stitch in. However, remember to make the gap bigger than the handle by at least 1.5" to allow for the space taken up by the zipper. Good luck and can't wait to see a picture of it in the Flickr group or on my Facebook page. Hi there, unfortunately not. You could copy and paste the information here into a Word document and then print it. I hope that helps. I love this, but instead of leaving an opening, I am going to put in a zipper. Or maybe a flap with velcro to close the gap while the machine is being stored. I think a zip at the top is such a good idea. I hope you post pictures and let me know how it turns out. I cannot wrap my head around how that handle opening tucks so nicely. I am going to try to do as soon as I get my top completed. Try it Latane, it is a bit like turning something right side out. At first it is a little creased around the opening but once you press it then it looks good. I use my sewing machine cover every day and the handle opening has survived perfectly. I hope it works out for you. HI I am trying to download the PDF but it just takes me to a blank page. Thank you for letting me know. The link and blog no longer seem to be present. I have updated the blog post to include a brief description of how I made the pocketed ends (as best as I can remember) and I have updated the measurements i.e.. measure your machine and add 1" to height, width and depth measurements to allow for seams/binding. I hope this helps. It was a long time ago so I cannot guarantee it will work perfectly as I also adapted it as I went along. Having said that, the sewwing machine cover is still in daily use so I was able to measure it to get the size of the pockets.